The Coalition for United Political Parties, CUPP, has called on the Governor of Lagos State Akinwumi Ambode, to resist alleged precondition for seeking re-election given to him by the leadership of the All Progressives Congress, APC in the state. The coalition called on the embattled Governor to take a stand by rejecting the terms which it alleged were being spelt for him by the party and its National Leader, Asiwaju Bola Tinubu, for seeking reelection in office as governor. “We, therefore, urge Governor Akinwumi Ambode to take a stand and be counted among the democrats. He must realize that the fate of Nigeria’s commercial capital rests upon his shoulders and that he is ultimately answerable to a vast majority of Lagosians who will want to know why he jettisoned the mandate freely given to him without as much as a whimper,” the statement added. “The people of Lagos must firmly resist the rampaging army of modern-day slave drivers who misrepresent democracy with civilian tyranny. Lagos is nobody’s personal fiefdom. “The CUPP has watched with keen interest the unfolding political drama in Lagos State where the vaunting interest of one man is threatening the political stability of the commercial centre of Nigeria while the President watches uncaringly with toothpick in between his lips. “The same party which promised change; having a chairman with labour background and a President who undeservedly ascribes integrity to his name, idly stands by while one man sustains his stranglehold on Lagos; apportioning political offices and dictating who becomes and who does not become what in Lagos State. This is the colour of the APC democracy! “Reports emanating from several reliable sources from meetings held to tighten the grip of the National Leader of the APC on the treasury of Lagos State include such obnoxious conditions that Governor Akinwumi Ambode must sign an undated resignation letter which he would submit to the APC leadership before he would be supported to run for his second term in office. “The reverbrating silence that has greeted this inexplicable impunity shows that the highest echelon of the party including the President and the National Chairman, Comrade Adams Oshiomhole are party to this hideous violation of the agelong tenets of democracy. 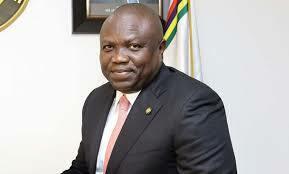 “Needless to mention the grand plot to sustain the institutionalized plundering of the resources of Lagos State. “The second condition is that the Governor would not be involved in the nomination process of all the candidates of his party for the House of Assembly. Such crude disenfranchisement insults the person of Ambode and denigrates the office of the governor. This is also to ensure that his impeachment goes through easily if he declines to sign the resignation letter. “While the last condition is that the Governor will always have to consult the National Leader of APC, Asiwaju Bola Tinubu and obtain his approval whenever he wants to carry out any major project in Lagos State. “It is a sad day for democracy; and mostly unfortunate that our democracy has been so trivialized that it has been privatized with the stake and aspirations of the people of Lagos state rendered inconsequential. “It’s neither surprising that the usually garrulous National Chairman of the APC, Adams Oshiohmole couldn’t find words for the travesty playing out in Lagos state nor is it strange in the least that the President who feigns ignorance even in issues of national importance is mum to the ridiculing of democracy in Lagos state. “Apparently, it is convenient for the President to continue to play the ostrich in the misguided hope that Tinubu will be the political asset he needs to keep his doomed second term bid alive in the South West. “Soon Mr. President and his party will realize how much they have squandered their goodwill and abused the mandate given by Lagosians and Nigerians. “Sadly, under APC, Lagos has become a study in infamy. There is no better definition of voodoo politics than for a person who does not enjoy the mandate of the people to be the person dispensing the mandate. This is an all-time low and shows that the APC is a political party by day and a ravenous cult group by night. “Sitting comfortably to share the common patrimony of all Lagosians without batting an eyelid as to the feelings and reactions of Lagosians is the height of impunity. “It was such full-blown exhibition of arrogance and mean-spiritedness occasioned by the serial looting of the commonwealth of Lagosians that led the National Leader of APC to declare in one of their disorganized campaign outings in Osun State that he was richer than Osun State. “Expectedly, it is consequent upon this vile utterance and the blatant ineptitude of the APC across the country that the people of Osun State have resolved to punish the APC for the insensitivity of flaunting their squandermania mentality in a state as dignified as Osun state. “The CUPP hereby urges Lagosians and indeed voters all over the country to go and collect their PVC preparatory to enforcing the quit notice on APC in 2019. “No other party and no other time in history have our countrymen been visited with such pain, misery and despair as currently being served on our people by the APC. “The APC is undeserving of votes, and the sophistication of the good people of Lagos has been tasked and challenged by this devilish plot and we hope Lagosians will respond appropriately with their votes against the marauding anti-people forces of the APC. “We, therefore, urge Governor Akinwumi Ambode to take a stand and be counted among the democrats. He must realize that the fate of Nigeria’s commercial capital rests upon his shoulders and that he is ultimately answerable to a vast majority of Lagosians who will want to know why he jettisoned the mandate freely given to him without as much as a whimper.